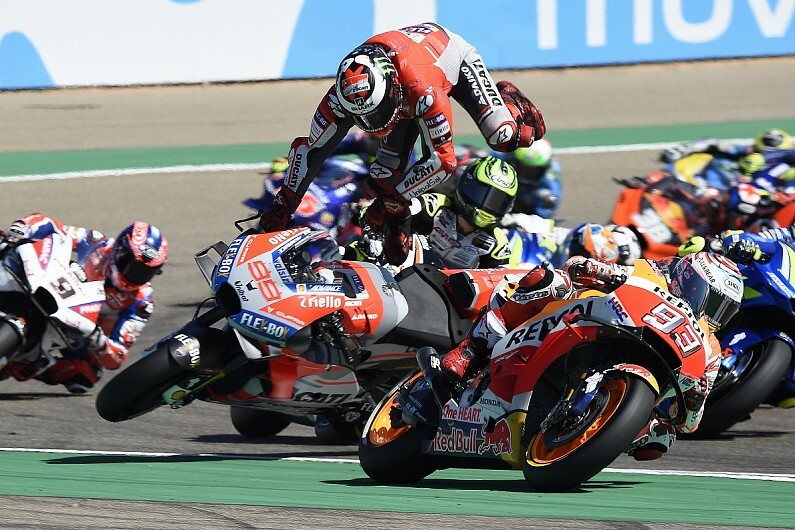 Marc Marquez won the Aragon Grand Prix to extend his overall lead of the MotoGP championship to 72 points on Sunday, after pole-sitter Jorge Lorenzo crashed on the opening lap. Lorenzo flew off his Ducati on the race's first turn and was taken to the MotorLand Circuit's medical center, where medical staff determined he had a dislocated toe on his right foot. Marquez, who started from third on the grid, traded the lead with Andrea Dovizioso until finally taking charge for good on Lap 21. Marquez finished ahead of Dovizioso and Andrea Iannone to claim the race for a third consecutive year. It was Marquez's first win in five races. "I had been taking risks in races, but it wasn't enough to win," Marquez said. "This time I saw I could finish it off, and I said 'Let's go for it.' I wanted to win. I have an advantage, but I wanted to end this drought." Marquez stayed on course to securing a fifth MotoGP world title with his sixth win of the season. The Honda rider has 246 points, followed by Dovizioso with 174 and five races remaining. Riders get 25 points for each win. In Moto2, Brad Binder won from pole followed by Francesco Bagnaia and Lorenzo Baldassarri. Bagnaia leads the category by 19 points ahead of Miguel Oliveira. In Moto3, points leader Jorge Martin won to increase his lead over Enea Bastianini to 13 points. Bastianini finished third in Sunday's race behind Marco Bezzecchi.